The Osage Indian who taught me the preceding game gave me this one also; he had no name for it. There is a Hawaiian example done with a single string loop preserved in the Philadelphia Free Museum of Science and Art. It was collected by Mr. Stewart Culin, is numbered 21448 and called Pa-pi-o-ma-ka-nu-i-nu-i (see Culin, 1, pl. xiv, a). 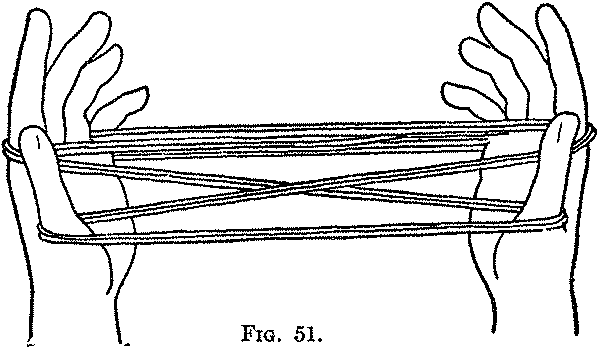 First: Opening A, with the string doubled and used throughout as if it were a single string (Fig. 51). Second: Release the loops from the thumbs. 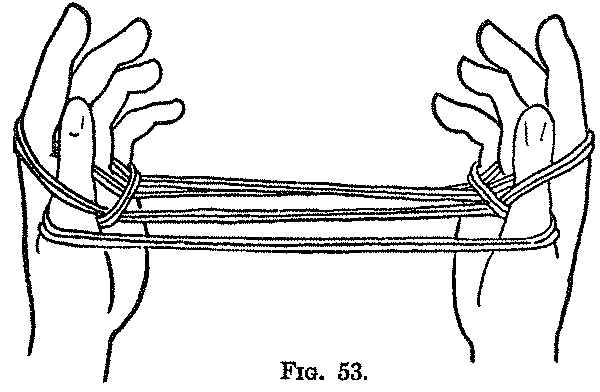 Third: Pass each thumb away from you over the index loops and the near little finger strings, and take up, from below, on the back of the thumb the far little finger strings and return the thumb to its former position (Fig. 52). 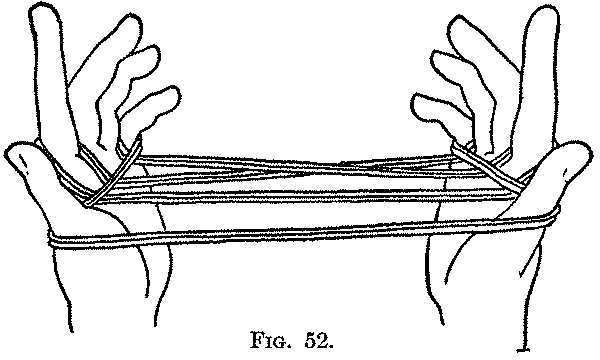 Fourth: Insert each thumb from below into the index loops, close to the index, between the finger and the strings which cross the palm and return the thumb to its position (Fig. 53). Fifth: Turn each thumb down toward the other thumb (Fig. 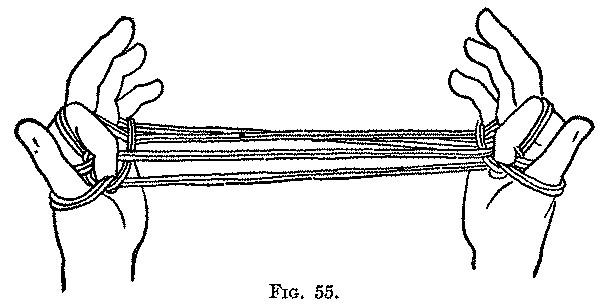 54, Left hand), and, letting the lower loops slip off the thumb, turn the thumb up toward you (Fig. 54, Right hand). 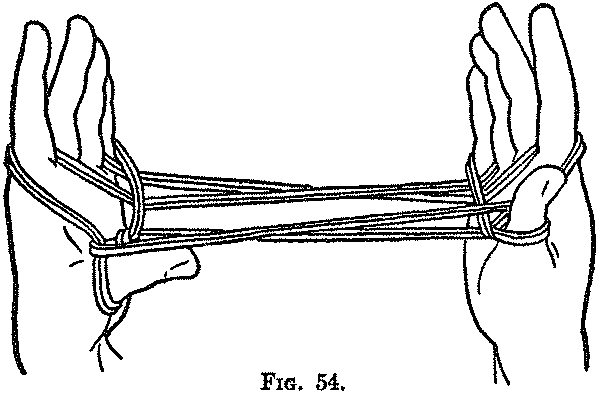 Sixth: Insert each index from above into the triangle formed between the thumb and index by the palmar strings looping around the strings of the thumb loops (Fig. 55), then, while turning the palms downward and then away from you, release the loops from the little fingers, and separate the index fingers widely from the thumbs to extend the figure (Fig. 56). This is a slightly different and abbreviated form of the Osage Diamonds. 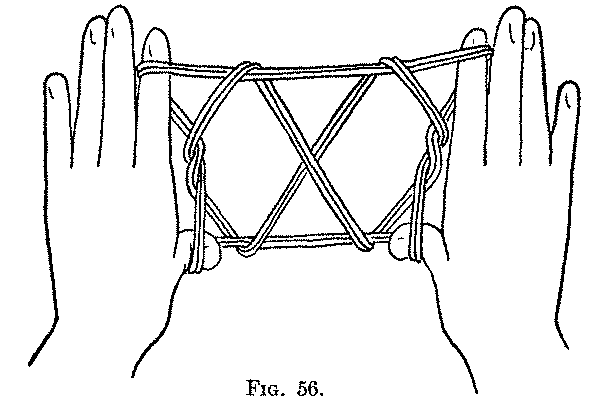 Of course it can be done also with a single string loop, but the final pattern is not so effective and closely resembles the final figure of the Navaho "Twin Stars."